The approach by air into Los Angeles takes you over miles and miles of urban sprawl leaving you wondering whether there’s a heart in this city at all. And when you process in your mind decades of half remembered references to the City of Angles, they all seem to coalesce around existential angst – the famous opening to Bret Easton Ellis’s Less than Zero (“people are afraid to merge on freeways in Los Angeles”), the Red Hot Chili Peppers’ “Under the Bridge”(“lonely as I am, together we cry”), Neil Diamond’s “I am I said” (“LA’s fine but it ain’t home). However, Tom Bradley airport is airy and bright when we get off the plane and surprisingly fast and friendly through emigration restoring a more sanguine mood as we speed down the freeway courtesy of our friends at AlliedPRA who sponsored the arrival transport for this year’s FICP annual conference. 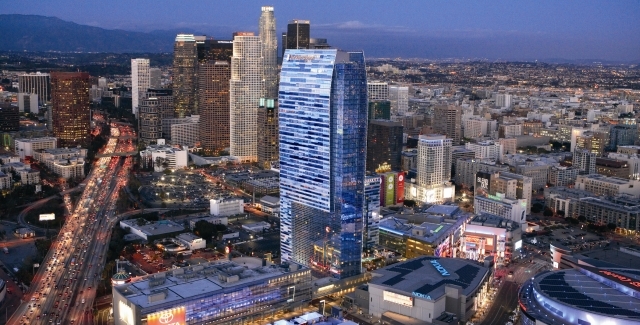 We’re staying at LA Live, a $2.5billion urban regeneration project on 27 acres comprised of structures and supporting facilities whose sole objective is entertainment. If LA is Mecca for movies then LA Live is its epi-centre. Our event coincides with the premiere of the latest edition of the Twilight series “Breaking Dawn Part 2” and already the Nokia Plaza is thronged with young kids on all night camping vigils in anticipation of a barrier position from which to view Robert Pattinson or Kristen Stewart as they gambol down the red carpet for this evening premiere. Except the carpet isn’t red. It’s black! The J.W Marriott, our host hotel, is incorporated into a 54 story iconic structure that towers over the entire complex, a bit like the church steeple in a European town. It has nearly 900 bedrooms and acres of great meeting space. From my bedroom on the 14th floor I’m looking out at the roof of the Staples Centre and the LA Convention Centre and, way in the distance, to the south west, I can see the mountains that limit the LA sprawl. The hotel charges for WiFi of pretty inferior quality although FICP, as part of the technology theme of the conference, has negotiated its own access which is free of charge. By Sunday lunchtime the registration area is buzzing with anticipation and the Technology Showcase is up and running. Sam Stanton and his great team at Red Button TV are doing their thing once again. I set Sam the objective of converting Carol Krugman, a confirmed Social Media Luddite, into the evangelist that I know she can be. More of this anon. The Opening General Session sets the bar high for the remainder of the event with a brilliant animation around the value and importance of live events in general and membership in FICP in particular. It’s powerful, punchy and impactful, characterising FICP as a dynamic, contemporary association with a clear vision and mission. This is further enhanced by a sharp new brand device that truly nails FICP’s credentials. Best of all this new important strategic direction is presented to us with great humour and humanity by this year’s FICP president Koleen Roach. She makes an impressive entrance as the Cha Cha partner to a celebrity dancer whose fame hasn’t yet extended beyond the shores of North America (so I don’t know who he is!) and then launches, breathlessly but effectively, into a warm and mostly ad-libbed opening address. Todd Zint, last year’s president, makes a brief re-appearance as Chair of the design team for this year’s event (Great job guys!) and then it’s show time with Event MC, the incredibly upbeat and in-your-face Laura Schwartz, former Director of Events at the White House during Bill Clinton’s administration. Laura plays touch tag with The Watercoolers, a 5 piece vocal group who re-write songs we know and love to give a humorous shout-out to the vendors whose support makes FICP possible. This was a truly innovative way of acknowledging sponsors and made for an energising, up-beat opening event. When adult beverages, appetisers and a DJ were introduced last year into The Network its effectiveness and satisfaction rankings improved dramatically. Thanks to sponsorship from Hyatt and prizes from Maui Jims, the best sunglasses in the world, we have another excellent Network this year. Maeve and I have great catch up chats with Kelly Porter, Lynne Schueler and Mary Schneider and I was thrilled to meet Goro Abe from Alliance Bernstein with whom we’re working a programme in Osaka. The 2 hours fly by and soon we’re into our evening function which creatively showcases the amazing event opportunities available at LA Live. We enjoy more adult beverages and appetisers outdoors at the Nokia Plaza which has a feel of Times Square about it with its gigantic LED panels and screens. We’re given a chance to walk the red (ie black) carpet and be curiously examined by the teenage throngs awaiting the real celebrities there this evening. Our progressive dinner then moves into Club Nokia where we enjoy great food by Wolfgang Puck catering. I then spend an engaging hour wandering around the exhibits at the Grammy Museum enjoying, to my surprise, the riveting performance of Prince and Beyonce from the 2004 awards – nearly 10 years ago! Jet lag and the attendant need for sleep then catches up with me and I slip away missing the live performance by American Idol finalist, Matt Rogers. My 17 year old twins will not be impressed! NB Huge respect and kudos to Eldon Gale of Nationwide Insurance for his stunning rendition of the Canadian National Anthem. Truly remarkable! Padraic Gilligan is Vice President of Ovation Global DMC and former president of Site. He has been a hospitality partner at FICP for almost 10 years.